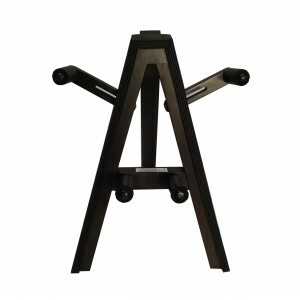 The Vstand is engineered for the safest solution to softly cradle a flying V guitar. Vstand tm – Engineered for the safest solution to cradle any V shaped guitar. Internally counter-weighted legs and hi-friction protective foam, ensures stability and grip. Precise angles and construction create a secure base for your V style guitar. Additional sway arms are added as a fail-safe to catch the guitar. Rear leg folds for more compact storage or transportation. Includes customized kit to fit any V shaped guitar.